Acne is a common condition that can occur in people of all ages, although it's often associated with teenagers and adults suffering from hormonal imbalances. Our skin is covered in tiny holes called pores and at the base of these pores are sebaceous glands that produce an oil known as sebum that helps to keep our skin soft and supple. When your body produces an excess amount of sebum and dead skin cells, the two can build up in the hair follicles. They form a soft plug, creating an environment where bacteria can thrive. If the clogged pore becomes infected with bacteria, inflammation results. Often, acne will disappear on its own over time with no need for treatment, however, for others the issue can last for months and in some cases even years. Conventional treatments for acne often involves pharmaceutical drugs with potential side-effects ranging from drowsiness to a loss of appetite. Chemical peels are another option that we feel should be avoided wherever possible. Luckily, there are a number of completely natural approaches to treating acne that are safe for people of all ages leaving no risk of scarring in the future and one of these approaches is using coconut oil. Coconut oil was pretty much the biggest natural health product of 2014 and with good reason. The list of uses for this highly nutrient-rich saturated fat is vast and the benefits it offers those in search of a natural treatment for acne should not be underestimated. This remarkable fat is hard at room temperature, but quickly turns into its liquid state when in contact with the warmth of the body. It possesses a wide range of antimicrobial properties that not only helps to unblock clogged pores, but also nourishes and moisturises dry areas where needed. Make sure when choosing coconut oil that you go for a good quality brand of extra virgin coconut oil that has not been hydrogenated, bleached, or refined in any way or any fragrance or dyes added to it. To ensure you get the best results, it is important to use a quality product. Coconut oil that has been over-processed will have lost much of the qualities that can benefit your skin. There are two ways to effectively use coconut oil to help improve your acne. 1. Taking it internally - try eating 2-3 tablespoons of coconut oil per day. 2. Using it topically - use a small ball of coconut oil on your face or body daily or just when it is feeling particularly dry. Although you might baulk a the idea of using oil on what you perceive as already over-oily skin, consider the fact that the more oil your skin absorbs the less it feels it needs to produce itself and acne at its base is a production of too much sebum. Applying coconut oil can actually help to regulate the skins production of sebum which is usually over active in acne sufferers. When applying the oil you don't need to use too much. Coconut oil is solid at room temperature but melts as soon as it hits the warmth of the body. You will find that little goes a long way. Coconut oil helps to boost your liver's ability to filter out toxins from the blood, this is known to dramatically reduce excess sebum production. Regular use of coconut oil helps your cells to expel more toxins through the skin relieving your liver of detoxification load, helping to control your sebum production and reducing oily skin. Coconut oil is known to stimulate bowel movements, helping to quickly clear toxic waste from the colon and prevent it from absorbing into your bloodstream. Another great use of coconut oil is as part of an exfoliant scrub that removes dead skin cells and clearing clogged pores. 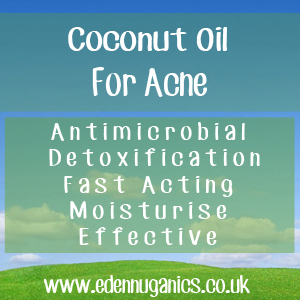 The antimicrobial properties of coconut oil make it perfect for killing excess acne bacteria as well as Candida. Coconut oil is brim full of medium-chain fatty acids (MCFAs), in fact around 64% of coconut oil is made up of these unique acids which offer detoxifying and hormone-regulating properties. Coconut oil helps to balance the Ph levels in your skin. Coconut oil contains vitamin E which is well-known for its anti-ageing and beneficial effect on the skin. Tip - Coconut oil really does go a long way. If you are finding yourself left feeling like an oil slick after your daily dose of oil, consider using a smaller amount. A conservative approach is not only more cost effective, but often more efficient as well. So to round up, high quality coconut oil can help treat acne by expelling toxins, fighting bacteria and yeast, offering antioxidant protection and speeding up healing of acne and acne scars. How to Use Coconut Oil for Acne Treatment?